Happy Monday! I am excited to share a recent quilt finish with you all today! I started this quilt last summer, so I am glad that it’s finally done! 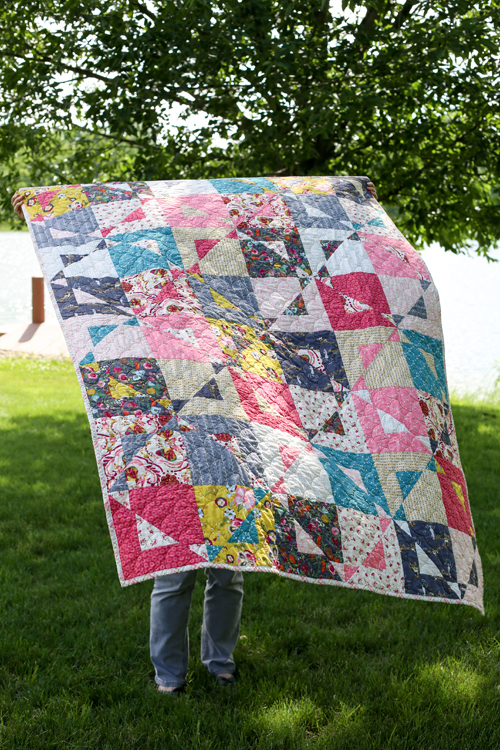 I have loved Aneela Hoey’s Magic Stars quilt (pattern here!) ever since she released it. When Bari J and I swapped some fabric last summer, I knew I had found the perfect match! The top stitched up so quickly, but then I let it sit for a while. 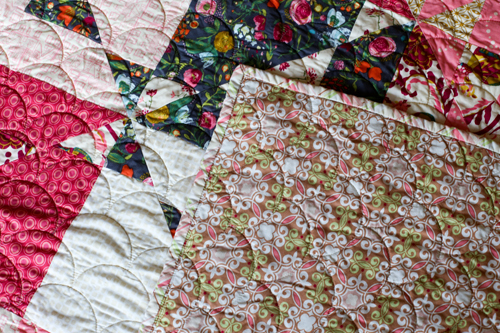 I sent it along with some other tops to Melissa of Sew Shabby Quilting to be quilted in the Fall. Then it sat waiting to be bound until last month! I had shown the quilt top to my Mom last year, and she really liked it. So, I finished it up last month for her Birthday! 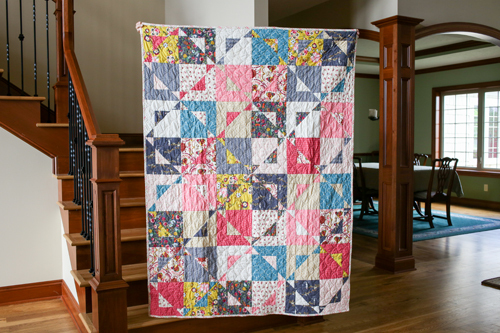 She has a nice quilt ladder that needs filling up with pretty quilts! I added one extra row (six extra blocks) to this quilt to make it just a tad bigger. It was fun laying out all the pieces before piecing to make sure I had a good variety in my blocks. I’m sure I spent way more time on that than was needed, haha. I tend to get a little obsessive about that part. Oh well! I used the Autumn’s Sigh colorway from Emmy Grace plus a few additional Art Gallery Elements for this quilt. The backing and binding are both from Coquette by Art Gallery In-House. I've been saving both prints for a while! 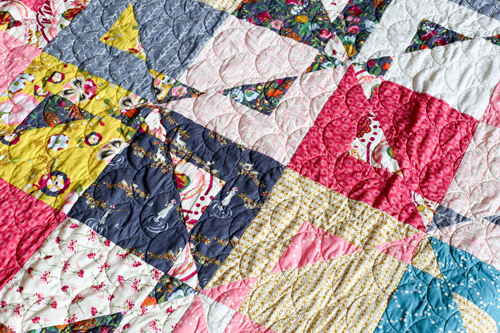 Melissa quilted it with this fun clamshell design. I think it pairs well with Bari’s style! 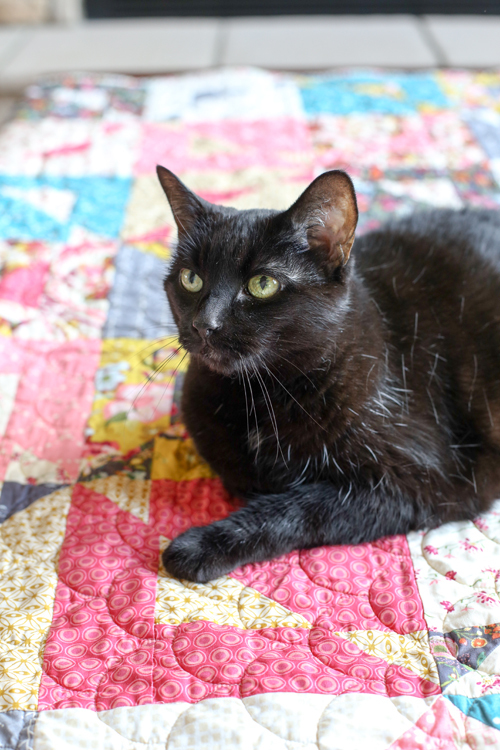 My Mom (and Blackie), were happy with the finished quilt! I loved stitching it up, and I know I’ll make another one at some point. This was a great just-for-fun project. 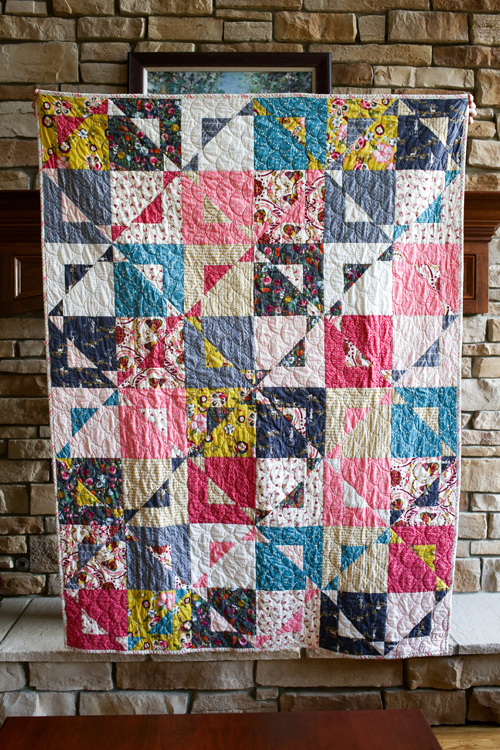 I need to start another quilt just because! Wow, was a lovely quilt. Your mum is very lucky. Its my dream to have a ladder full of quilts. That's a foolproof way of giving someone a quilt that you know they love - letting them see it first to see their reaction :-) My daughter spied one I had in the works and claimed it for herself on the spot. Yours is so pretty! it's so so pretty! 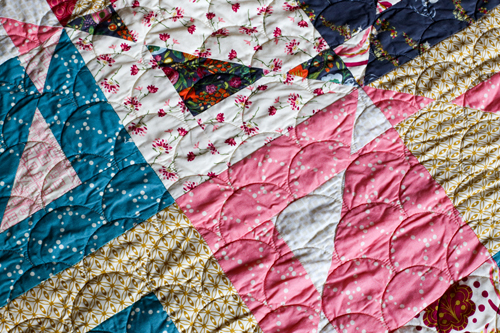 Love that quilting too. That is a really neat design. Great job. It's beautiful and I'm sure your mom is thrilled to have it! I love it so much! The quilting perfect for the top, too!